As Obama and Romney have lunch at 12:30 pm ET, not everyone is moving on from the ’12 race… Romney chief strategist Stu Stevens explains Romney’s loss by essentially suggesting Obama was black and poor people voted overwhelmingly for him… As it turns out, Obama’s victory was more decisive than Bush’s in ’04… Tom Cole and the cover he gives to John Boehner… NYT: Other Benghazi-related questions get lost in all the attention on the talking points… 112th Congress on track to be least productive Congress since 1947… And the importance of Virginia and its gubernatorial contest. *** Moving on? At 12:30 pm ET today, President Obama holds a private lunch with Mitt Romney -- their first meeting since the election and just seventh overall according to our count. The lunch allows both men to bury the hatchet and show that this country is able to move beyond its elections. But not everyone is moving on. 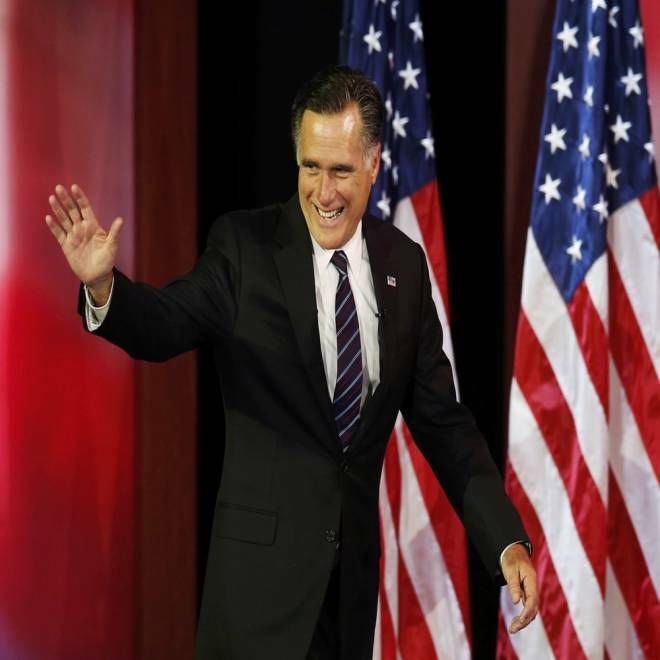 In a Washington Post op-ed published yesterday, Romney chief strategist Stu Stevens defended Romney and his campaign. “Over the years, one of the more troubling characteristics of the Democratic Party and the left in general has been a shortage of loyalty and an abundance of self-loathing. It would be a shame if we Republicans took a narrow presidential loss as a signal that those are traits we should emulate.” It was more than appropriate for Stevens to write about Romney and the campaign after the election; in fact, Stevens speaks today at Harvard along with the top officials from the Obama campaign to discuss the 2012 race. But what’s especially striking about Stevens’ op-ed is that it doesn’t contain an iota of introspection about why the Romney campaign was unable to win a winnable race. It was an odd tone for Stevens to strike, and it will be curious to see if he’s just as defiant today at Harvard. After a hard-fought election, President Obama fulfills his promise to engage with Mitt Romney, hosting him for a one-on-one lunch at the White House. NBC's Chuck Todd reports. *** Explaining Romney’s loss -- Obama was black and poor people voted overwhelmingly for him: Indeed, the entire piece appears to rationalize that the campaign’s strategy was right. (And for the reporters who received emails from Stevens during the campaign, the tone was very, very familiar.) In the op-ed, Stevens essentially suggests Romney lost because poor people overwhelmingly voted for Obama. “On Nov. 6, Romney carried the majority of every economic group except those with less than $50,000 a year in household income. That means he carried the majority of middle-class voters.” Yet that analysis ignores that those making less than $50,000 represented 41% of the electorate in 2012, and many of those people probably would argue that they’re in the middle class. Stevens also seems to argue that Obama won because he’s a black man whose campaign and party raised $1 billion. “[H]e was a charismatic African American president with a billion dollars, no primary and media that often felt morally conflicted about being critical. How easy is that to replicate?” But that also leaves out the fact that Romney was a white man who had a famous name in American politics and whose effort also raised close to $1 billion. By the way, there’s a lot of contradictory evidence to suggest the president carried the middle -- the swing suburban counties. In every swing state, the largest major suburban county tipped to the president. President Barack Obama plans to fulfill the promise he made on Election night to engage with Mitt Romney by meeting him for lunch on Thursday. The Daily Rundown's Chuck Todd reports. *** Obama’s victory was more decisive than Bush’s in ’04: And here’s one final observation about the 2012 race. Per the excellent work by the Cook Political Report’s David Wasserman, Obama’s national lead over Romney continues to expand as votes keep on coming in. It’s now Obama 50.9%, Romney 47.4%. That’s a bigger (and more decisive) margin than Bush’s victory over John Kerry in 2004 (which was Bush 50.7% and Kerry 48.2%). What’s more, the president’s lead has grown to close to 3 points in Ohio, 4 points in Virginia and 6 points in Colorado. One doesn’t win Colorado by six points without winning swing voters; there isn’t a big-enough Democratic base to make that argument. Republican presidential nominee Mitt Romney arrives to deliver his concession speech during his election night rally in Boston, Massachusetts, November 7, 2012. *** Cole gives cover to Boehner: In today’s “fiscal cliff” news, Treasury Secretary Tim Geithner is meeting individually with top Democratic and Republican congressional leaders. Bloomberg News: “Geithner will meet separately with each of the four top leaders in Congress: House Speaker John Boehner, House Minority Leader Nancy Pelosi, Senate Majority Leader Harry Reid and Senate Minority Leader Mitch McConnell. Rob Nabors, the administration’s director of legislative affairs, will accompany Geithner.” And speaking of Boehner, GOP Rep. Tom Cole -- who on Tuesday said that Republicans should extend the Bush tax cuts for only those making $250,000 or less -- did a big favor for the House speaker. Why? It gives him A LOT more space to cut a deal with the Obama White House. After all, when is the last time that a conservative (albeit an establishment) House member go to the left of Boehner? Bottom line: Cole’s move gives Boehner more negotiating flexibility than he had previously. Also, don't miss David Gregory's interview with former FDIC Chair Sheila Bair, who is very critical of Geithner. *** Other Benghazi-related questions get lost in all the attention on the talking points: For weeks now, there’s has been so much attention on Susan Rice and those CIA-drafted talking points about the attack on the Benghazi consulate. And after more critical comments from GOP senators, Obama showered praise on Rice during a photo spray of his cabinet meeting yesterday. “Susan Rice is extraordinary. I couldn’t be prouder of the job that she’s done.” But the New York Times makes a pretty good point: Lost in all of the attention over the talking points are bigger and perhaps more important questions. “Were requests for greater security for diplomats in Libya ignored? Even if Al Qaeda’s core in Pakistan has been decimated, what threat is posed by its affiliates and imitators in other countries where they have taken refuge? How can crucial diplomacy be conducted amid the dangerous chaos that has followed the toppling of dictators across the Arab world?” Also, while this hasn’t been the best P.R. week for Rice, it does look like she can survive a confirmation process. The person who may have had a worse week in these meetings? CIA acting dir. Mike Morrell. He could end up the real political loser in all this. *** Do-Nothing Congress? NBC’s Kyle Inskeep notes that this 112th Congress is headed to achieve a dubious distinction: the least productive Congress since the 1940s. With just weeks left, this Congress (2011-12) has passed just 196 bills into law (and many of those have been ceremonial pieces of legislation, like the naming of courthouses). The previous low was set by the 104th Congress (1995-96), which passed just 333 bills into law. So to avoid earning the distinction as the least productive Congress since 1947, 138 bills must move through the House and Senate before the end of the session next month -- an unlikely feat. Then again, reaching a deal on the fiscal negotiations would be a big legislative accomplishment. Also, there are plenty of conservatives who would argue that NOT passing bills actually means this was a productive Congress. It’s all eye-of-the-beholder stuff. *** The importance of Virginia its gubernatorial race: Virginia has arguably become the most important swing state in the country (in the past two presidential elections, the state has exactly matched the national popular vote). And Virginia’s off-year gubernatorial contest has recently set the tone for the party of out of power. In 2005, Tim Kaine (D) won his race by appealing to independents and the suburbs -- a model the Democrats replicated in 2006 and 2008. In ‘09, the socially conservative Bob McDonnell (R) focused like a laser on the economy, which congressional Republicans followed in ’10 and even Romney tried to replicate in ‘12. Yet here’s the conundrum for Republicans in 2013: The very conservative and outspoken Ken Cuccinelli is going to be the face of the GOP next year. Now it’s more than possible that Cuccinelli runs a strong race that national Republicans will copy in 2014. Or it’s also possible that his candidacy reinforces some of the negative stereotypes that the party wants to erase. By the way, Lt. Gov. Bill Bolling -- whose exit cleared the way for Cuccinelli’s nomination -- isn’t going away quietly. Per the Roanoke Times, he isn’t ruling out a gubernatorial bid as an independent.